Seems impossible, right? What about character development? Dialogue? Plot? I nearly cried when I read that. It’s heart-wrenching. The unspoken storyline packed into those critical pauses adds to the poignancy. Constraint gives the innovator, the artist, the designer, the writer a starting point. And it doesn’t really matter what the constraint is. Give someone a blank sheet of paper, tell them to write something great and guess what happens. People seem to freeze when the world is opened to them. People have trouble creating on demand. Especially when the world is open to them. Writers know that you don’t just sit down and write a masterpiece. A good story doesn’t start with a blank screen. A good story starts with a conflict. The conflict serves as a constraint within which the writer can spin a yarn. Constraints are phenomenally effective at generating new thinking. They often present a problem that needs to be overcome. Non-creative people see a constraint and give up. Creative people see the same constraint and get energized. Piet Mondrian used the self-imposed constraint of 90-degree angles and primary colors to develop his new style of art. 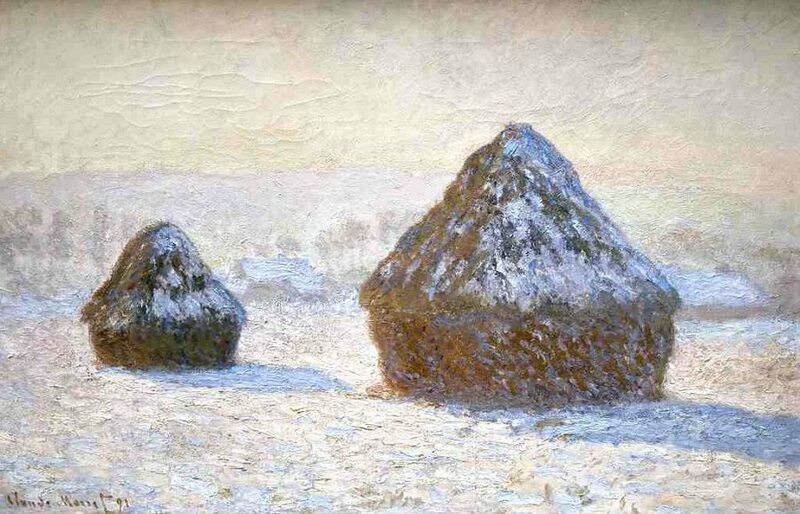 Claude Monet once bought a field with haystacks — which he demanded never be taken down — so he could paint the same subject year round. The constraint was a single subject that gave him license to explore the effects of changing light throughout the seasons. How do you do this in writing? Here’s an example for fiction writing. When I find that chapter after chapter feels stale (and if you’ve read my recent blog post, you know that I fell asleep while reading my manuscript), I force a constraint to mix things up. Changing the setting is one way to do this. What if the scene has to take place under the bleachers or on a hike or during a sermon? The new setting creates opportunity to enhance the story. Picture that great scene in When Harry Met Sally, when Harry is telling his best friend, Jess, about his divorce. Nora Ephron brilliantly sets the scene at an NFL football game. Harry is pouring out his heart. He’s bitter, hurt, angry. And then every few seconds — without blinking an eye — they stand and do the wave. Setting is just one type of constraint a writer can choose from. There are thousands more—force an unspoken dialogue, give the protagonist a phobia, shorten the timeline. Make a list of some. Let your brain have fun with it. And I love the creativity that comes from constraints.